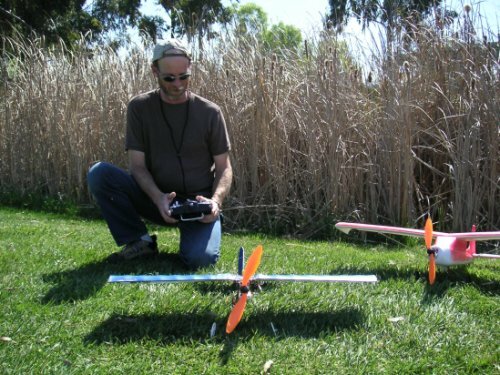 Dave was doing fine with the Slow Stick, Pico Stick, and T-Hawk, but wanted an aileron trainer since those are all three-channel planes. Enter the WattAge Mini Blue Max. It has an undercambered foam wing (like the Slow Stick but not so thick) with plenty of dihedral, ailerons, and a foam fuselage made from a sheet of triangular foam folded into a triangle. Looked like an easy build and a low-risk plane. Well, it didn't work out that way. The wings sit on top of a plastic dingus that doesn't fit well on the fuselage, and the fuselage itself is bendy and flexy and has no way to mount any reasonable size bettery (I guess they assume you'll use their own brand batteries). 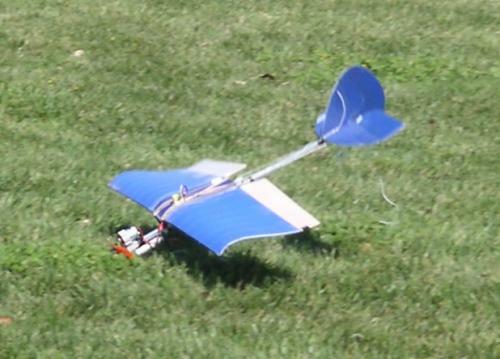 But when we finally got it together, we took it out and broke the fuselage on the first hard landing (which didn't take long, since there was basically no effect from the ailerons set at the recommended travel). Ugh. Dave wanted to put the plane on the ground and drive over it, but I persuaded him that the wing might be useful with a better fuselage, and we put it in the garage ... until a few weeks later, when we noticed that Aeromicro sells Slow Stick aluminum sticks and hardware kits, and I said "Hey, I wonder if the Blue Max wing would fit on that?" Sure enough, it does. It didn't fly well right off ... very little control from those flexy foam ailerons, for one thing. In the end, Dave clipped the wings a LOT, reduced the dihedral, and added great big balsa ailerons instead of the foam ones. 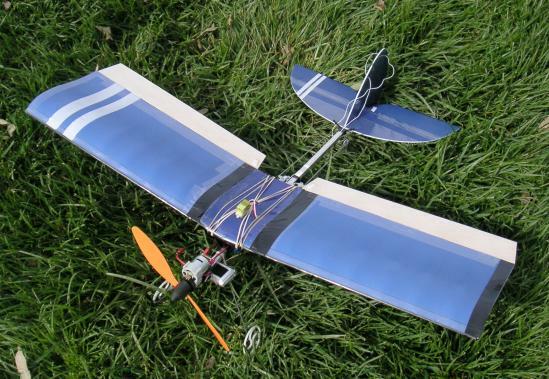 It ends up being almost the same length and wingspan as a Pico Stick -- but with ailerons and a much more rigid wing. But wait. Dave decided a few days later that it didn't really fly so well, so he decided to take the dihedral out of the wings, and even add a little anhedral, in the hope that the plane would be less stable and would turn better. The results were mixed. At first he thought it turned quite a bit better. But a few flights later, he was having the same non-responsiveness problems he complained about earlier. Then the wing broke in midair. The plane is now retired, at least temporarily.